Does god have parts? Yes, that sounds like a silly question, but let me explain, and I’m just sort of thinking out loud here, a kind of thought experiment. I recently saw a “Through the Wormhole” TV episode titled, “Is There a Creator,” where one scientist suggested that maybe the universe is a computer simulation because it does look a lot like it. As we have learned about the universe, there appears to be a minimum size to everything, matter, energy, and, it’s hypothesized, even time. That is, modern theory suggests there is a smallest possible unit of matter (quark? ), energy (photon? ), and time (Planck unit), and all things in the universe a built up from these. Interestingly, computers work much the same way, with pixels, bytes, and clock time. It seems to be widely agreed these days that god is not constructed of matter, but is rather some sort of energy or spirit. Well, if god is pure energy, how could he think? It’s pretty hard to imagine pure energy as having desires and intentions. That doesn’t seem to work at all. So, what if god is “spirit?” Well, spirit gets very hard to define. According to the online Merriam-Webster dictionary, the only meaning for “spirit” that appears relevant is, “a supernatural being or essence.” Now we have the added difficulty of this odd term, “supernatural.” We will return to this problem in a moment, but first let’s see what the bible says about whether god has parts. 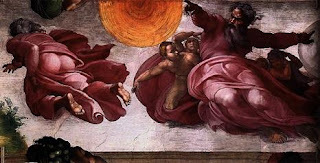 If Adam and Eve “heard the sound” of god as he was walking, then the author obviously assumed that god had legs (unless he walked on his hands), as there is no other way to walk. Then, god “called” to them, which implies that he had a voice box. What I’m getting at here is that according to the bible, god was assumed to have body parts. There are other passages in the bible which would appear to support this assumption. For example (Exodus 33:20-23): “And he said, ‘Thou canst not see my face: for there shall no man see me, and live. . . And I will take away mine hand, and thou shalt see my back parts: but my face shall not be seen.’ ” (Actually, I believe this is pretty good evidence that these primitive writers of ancient times made this stuff up. Their idea of a god was likely just a very, very big man with magical powers, rather than some sort of spirit). Of course, being the bible, there are some inconsistencies. In Exodus 33:11, we read, "The LORD would speak to Moses face to face, as one speaks to a friend.” Yet, just nine versus later we read, “ ’But,’ he said, ‘you cannot see my face, for no one may see me and live.’ ” Obviously, both of these verses cannot be true, but that’s not relevant to the matter at hand since both verses assert that god has a face. So, according to the bible, god has body parts. Now, since he supposedly got the idea to create a universe, and then carried it out, then he must be able to think. All thinking things that we have discovered have brains. Now, brains have neurons and the more neurons the more complex thoughts those brains have. For example, a frog has a bigger (better – more neurons) brain than a fly, and a dog has a bigger (better) brain than a frog. Interestingly, computer processors are also built up from pieces called transistors, and, generally, the more pieces, the faster the computer and the greater the memory. So, in all the cases we know of involving thought or computation, many pieces (or parts) are involved, and the more the better. We are left at this point to ponder, if god is not made up of pieces, but is just one piece, then how does he think? And yet, how could he be made of pieces, since that implies that the pieces existed independently before they came to be arranged in a god . . . so who or what made the pieces and arranged them into a god? A meta-god maybe? Some theologians, when presented with the evidence that a god such as the one described in the bible doesn’t make a lot of sense, have retreated to claiming god is merely a symbol (Karen Armstrong), or a “ground of being” which somehow supports the existence of everything else (David B. Hart), or some other fuzzy kind of entity. These ideas are clearly just inventions, however, flights of imagination, without any evidence whatsoever. At the very least, such a god is not the god of the bible and it wouldn’t know that people worship or pray to it, anyway. Such a god would be irrelevant to our lives. I’m not suggesting that I’ve proven anything here. I’m merely saying that I haven’t been able to imagine any god concept that makes any sense. Maybe you will be luckier. But whatever you come up with, you should keep in mind that it’s merely a theory, unless you can provide testable evidence. And nothing in the bible can qualify as evidence because it’s entirely hearsay and cannot be used to prove something in it any more than the “The Wizard of Oz” story can be used to prove the existence of the wizard. Of course, a standard theological objection to my line of reasoning is that god is a “spirit” and so shouldn’t be expected to be put together like matter or function like matter. But this conception has problems too. If god is pure spirit, then how does it interact with the material world? A ghost is a spirit (they say), but could a ghost catch a ball? Wouldn’t it go right through the ghost? If this god is pure spirit and can’t interact with the material world, then it is non-detectable and irrelevant, and therefore is not a god by any reasonable definition. But, if this spirit does interact with the material world (as all believers would insist), then you have the problem of HOW it interacts with the material world (think of the ghost). And, if it interacts with the material world despite this problem, then it should be detectable through its actions on the things of our world. It might be invisible perhaps, like gravity, but still detectable. Or, consider dark matter and dark energy. Physicists have no idea what either of these things actually is, but they have proven their existence beyond a shadow of a doubt through their interactions with the known material world. If the universe has an active and involved ruler, shouldn’t it be obvious by now, shouldn’t there be some clear evidence somewhere of its interactions with the things of this world which science could detect? According to the Online Etymology Dictionary, the word “supernatural” does not appear anywhere before the mid-15th century. Let’s go back to that definition of “spirit” as “a supernatural being or essence.” Believers will tell you that we can’t see god because he exists in a supernatural realm. Well, as we have seen, at least some of the bible’s authors would disagree as they described him taking walks in the Garden of Eden, hiding his face from Moses, and appearing to 70 of the elders of Israel. And remember that Moses went up a mountain to get the Ten Commandments tablets from god. In fact, there is very good evidence that, to the authors of the bible, god exists in the natural world and that is how all those people interacted with him. In fact, it appears that the very concept of a supernatural realm didn’t even exist when the scriptures were being written. According to the Online Etymology Dictionary, the word “supernatural” does not appear anywhere before the mid-15th century. Could it be that as man explored more and more of the world, climbed the mountains above the clouds, looked into the mouths of volcanoes, sailed the seas, and mapped more and more of the world, they still couldn’t find god and so they invented another world for him to exist in, the supernatural world? What an ingenious “solution!” If you can’t prove the existence of god, then claim he exists in a realm that you can’t prove exists. Doesn’t it seem that god is getting rather distant in all this? Notice that I suggested that man “invented” the supernatural. That is because no such realm has ever been detected, and no one has ever produced a testable (falsifiable) theory of it. It’s another case of the “god of the gaps.” As science continually shrinks the space available for god to act or to exist in, believers invent another escape route rather than face what’s staring them in the face. No, of course I haven’t actually proven anything here, but shouldn’t we be asking why it is that whenever we think more deeply on the matter of the existence of god, we turn up more and more difficult problems? And now, after thousands of years of looking for “him,” there is still no tangible, testable evidence that there is a god interacting with our world, whether of one piece or many, whether of matter or spirit, whether of face or backside or hemorrhoids. ExChristian.Net: Does God Have Parts?